We knew that tablets were growing more and more popular, but after cat-food producer Friskies launched three tablet games for your feline friends we can truly acknowledge that slates have become truly universal. The games have been tailor-made just for cats, so don’t even dare getting into their territory. Without any further ado, here are the titles: Cat Fishing, Tasty Treasures Hunt and Party Mix-Up. All of them are made for either the iPad or Android tablets. Just as you’d expect the storyline of all three games resolves around food, but we’d leave the rest of the paw-tapping fun for the video demo below. 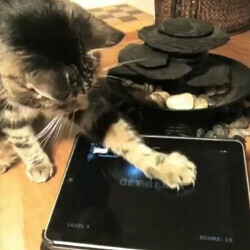 So maybe it’s about time you start considering a second tablet… for your cat? I wouldnt want my cats paws clawing at my screen! (even with a screen protector) If I had a cat that is. A game for a cat on a tablet? Last time I checked, cats didn't make enough money to buy a tablet... Ok, more serious, the chances of a claw coming out and scratching at that screen...too much chance for me, and i can get a toy for them for $3 at the store that can keep them for hours. I may love the high tech toys, but my cats do not need them. I don't really know anyone in their right mind that would let their cat(s) play with their iPad. Sorry "people buy clothing...." I type too fast for my own good. And this weeks sign that the Apocalypse is closer than I thought .... For cats. My brain hurts. I want one for dogs!